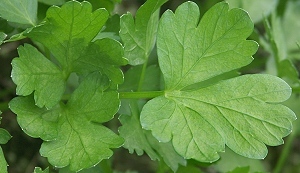 While most folks prefer Flat Leaf Parsley (also known as Italian Parsley) for cooking, Curled Parsley also has great flavor and can be used in any recipe calling for Parsley. 1. Have the butcher trim and tie a leg of lamb. Butter a shallow oven proof casserole or gratin dish just large enough to hold lamb comfortably. 2. Arrange potatoes in the bottom of the dish in overlapping rows. Salt and pepper them generously. 3. Place lamb on the potatoes and pour in chicken stock. Season generously with salt and pepper. 4. Roast lamb in a preheated 400 degree oven for 25 minutes per pound, or until lamb is pink and tender. If you prefer lamb well done, increase time to 30 minutes per pound. 5. To Make Dressing: Make a smooth paste of the garlic, parsley, bread crumbs, butter and lemon juice and season to taste with salt and pepper. 6. One hour before lamb is done, remove it; allow to cool for 15 minutes, spread it with dressing and return it to the oven for the remaining hour. In a blender, mix the milk, onion and egg. Put your ground pork in a bowl and pour the mixture of milk, onion and egg into meat, and then stir it until blended. Add allspice, salt and flour; make the meatballs about 1 to 2 inches and fry until done. Serve with boiled potatoes and parsley sauce. Melt butter in saucepan; add flour while stirring. Add milk, a little at a time, continually stirring until you reach a good sauce, thick or thin depending on your liking. Milk measurements can be increased or decreased. Add parsley and salt to taste. Serve on Danish Meatballs. Sprinkle fish with salt and garlic powder. Mix remaining ingredients and spread over fish. Bake at 350 degrees for 20 minutes, until fish flakes with fork. Simmer and strain brown sauce ingredients. Chill and remove any fat. Preheat oven to 350 degrees. Truss the birds with strong thread. Cook brown sauce and Juniper berries in saucepan until sauce is reduced in half. Using tongs, sauté the birds in butter over moderately high heat in an ovenproof pan until they are lightly browned on all sides. Place the pan in the oven for 30 minutes and baste quail 2 or 3 times. Remove the birds to warm platter and put in a warm oven. Spoon off excess butter and deglaze the sauté pan with the reduced brown sauce, strain the sauce back into the pan and add fresh green seedless grapes (can substitute 4 oz. le foie gras). Pour the sauce over the birds and serve. Quail should be juicy. Melt 3 tablespoons butter in a saucepan and add the flour. Cook briefly and add the cream. Simmer on low heat to make a very thick sauce. In another saucepan, melt 2 more tablespoons butter and sauté the shallots. Cook until light brown, and add the mushrooms. Stir well and cook 3 to 5 minutes. Add the sherry, brandy, and some dashes (3-6) of Tabasco, (1-3) Worcestershire, (3-6) soy sauces. Stir in 3 tablespoons chopped parsley and cook until reduced by half. Stir in the cream sauce and cool. Melt the remaining butter. Lay out a sheet of filo and brush it quickly with butter. Fold in half (from left to right) and butter again. Lay a 1 1/2 tablespoon bead of cream cheese on middle bottom of dough, then 3 times as much mushroom stuffing. Roll 1 turn, fold the ends (sides) in, and paint with butter. Roll up the rest of the way, and fold the corners in at the last turn. (1 down, 7 to 11 to go!) Repeat with remaining sheets. Place all the rolls on a baking sheet and bake in a preheated 425 degree oven for 5 to 8 minutes. Serve warm, with sour cream or any sauce. (Or combine 4 oz. brandy, 2 oz. port wine, and 2 tablespoons chopped shallots in a saucepan. Bring to a boil and reduce by 2/3's. Stir in 8 tablespoons unsalted butter, 1 tablespoon at a time. Keep warm over low heat and serve over the strudel.) Makes 8-12 rolls. Wash and dry chicken. Salt and pepper it inside and out. Rub the bird well, inside and out, with dressing made of the oil, lemon juice and thyme. Stuff the bird loosely with the fresh parsley and bake, uncovered, in a 350 degree oven for about 1 1/4 hours. Serves 3 or 4. Simmer lemon zest in oil 3-4 minutes. Add ginger and sugar; cook 3 minutes more. Stir often. Pour in stock, bring to boil. Reduce total liquid to approximately 1/2 cup. Meanwhile cook linguine until it is al dente. In a skillet cook chicken and shallots in margarine until lightly browned (3 minutes). Add lemon sauce mixture, then parsley and cook 3-4 minutes more. Put drained pasta in casserole. Toss sauce with pasta. Let stand 5 minutes to absorb flavors before serving. Combine parsley, onion, capers and garlic in blender or food processor. Cover and process until finely chopped. Add remaining ingredients and blend well. Chill. Serve with hot or cold stone crab claws or boiled shrimp. Makes 1 1/4 cups sauce. 1. Brown beef with garlic and green pepper over medium high heat until meat is no longer pink. Drain and discard fat. 2. Add parsley, tomato paste, tomatoes, jalapeno pepper, chili powder, cumin, oregano, cinnamon and salt and pepper to taste. 3. Place tortillas on a cookie sheet. Broil 6 inches from heat for 30 seconds on each side. 4. Top with 1/2 cup of meat mixture. Spread within 1/2 inch of the edges of the tortillas. Top with cheese and return to broiler. Broil until cheese is melted. 5. Top with fresh chopped tomatoes and shredded lettuce.